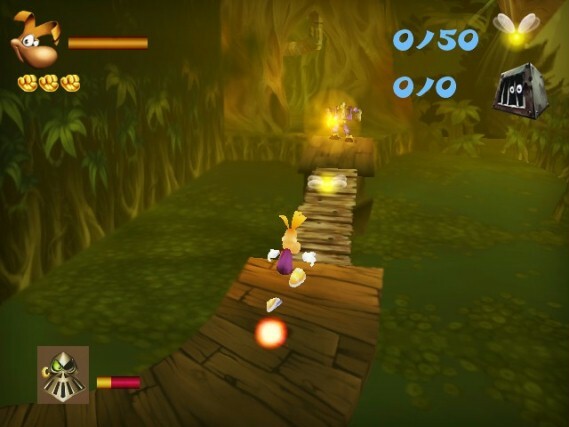 With a distinct lack of Mario amidst the Nintendo 3DS launch line-up, Ubisoft has propelled their platform-genre sensation Rayman to the frontlines, delivering an improved port of 1999 Nintendo 64 classic, Rayman 2: The Great Escape. Since release, the game has seen numerous releases across Dreamcast, PlayStation, PlayStation 2, Game Boy Color, and Nintendo DS platforms, with a further iteration developed for iOS devices as recently as last year. For those unfamiliar with the plot of the game, let me provide a brief recap. The Glade of Dreams falls under an invasion by an army of Robot-Pirates led by Admiral Razorbeard, throwing the Chamber of the Teensies and the Fairy Council into disarray. With Razorbeard’s henchmen aiming to conquer and enslave the entire world, small resistance groups, including Rayman and his friend Globox, make a futile attempt to fend off the invading forces. However, they are soon overwhelmed and the Primordial Core, the heart of the world, is soon destroyed. 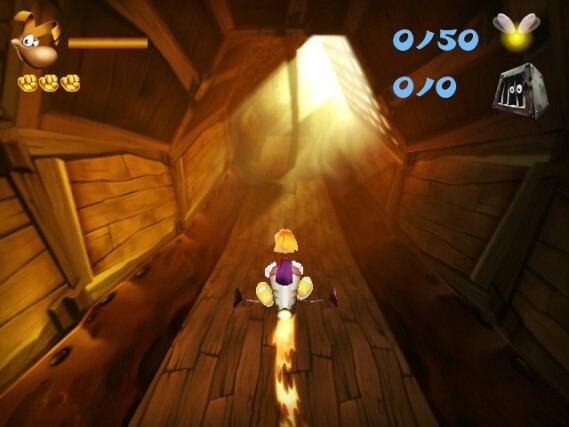 Such an event immediately causes Rayman to lose his powers, and he finds himself captured and is carted off to be held prisoner aboard the Buccaneer, the Pirate’s Prison Ship. It is here that the story begins, as Rayman seeks to rid the Glade of the Robot-Pirates whilst also seeking to restore his own powers. Along the way, you’ll meet a colourful and imaginative array of characters that will assist Rayman in his journey, from old friend Ly the fairy to the ancient, wise Teensies. It is Rayman’s characterful world that has long been its greatest asset, and it is presented in resplendent glory here once more coupled by a rather amusing script. You’ll find yourself challenged with overcoming obstacles, puzzles and enemies in your on-going quest to return The Glade of Dreams and freeing its inhabitants from dubious slavery. In doing so you’ll utilise Rayman’s hallmark abilities such as helicopter flight, firing energy spheres and swinging on Purple Lums. You will also jump, slide, swim and climb your way on your adventures, with a further highlight being the opportunities to commandeer a rocket used for enjoyable, speedy travel sections. An integral part of the game is the variety of coloured Lums that you’ll regularly discover with both the Yellow and Super Yellow playing the most significant role, allowing you to unlock access to new levels on the world map. There are 1,000 in total, meaning that there are plenty for completionists to hunt. Alongside this, Red and Blue Lums restore Rayman’s health and oxygen levels (when underwater) with Green Lums acting as checkpoints for you to return to when you die. 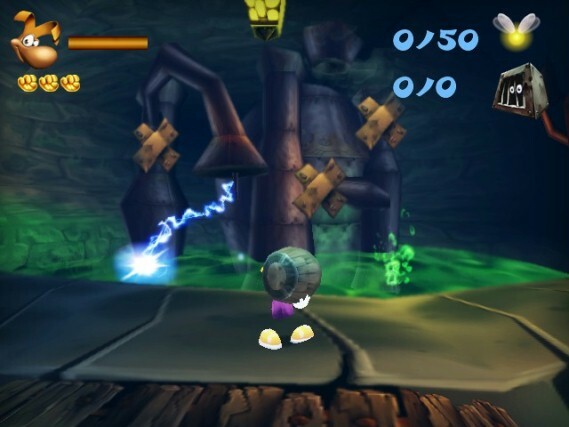 Lastly, Purple Lums allow you to swing yourself to new areas, and Silver Lums, left by Ly the fairy, grant Rayman new powers. If you ever find yourself at a loss with how to overcome a particular puzzle, you are also free to call upon the assistance of Murfy, a fly dubbed “The Flying Encyclopaedia” complete with a grin akin to that of the Cheshire Cat. He can, however, only be summoned by standing atop Stones of Thought and hammering down on the D-pad, yet his inclusion will surely aid those that require direction. Whilst Rayman 3D remains a solid, consistent port of its precursor, it can’t help but continually exude the feeling that it has now become a little dated. Such a comment is perhaps unsurprising considering the game is now twelve year’s old, but there was certainly plenty more room for Ubisoft to have made something more of Rayman’s anticipated return to the gaming scene. Even the menu system that immediately greets you will make you feel as if you’ve been transported back to the 90’s, with such an experience further hampered by unimaginative and poorly implemented loading screens. Making use of relevant artwork from the game, these are a regular occurrence whilst playing and aren’t even fitted to fill the screen – let alone being presented in 2D, and failing to utilise even a light use of the stereoscopic 3D visuals. To some, this won’t matter, yet to the majority, it’ll scream lazy development. Ubisoft has openly discussed the improvements that they have incorporated, and these are certainly noticeable. The visuals and character models, for a start, have a heightened degree of polish, yet don’t necessarily seem to push the hardware capabilities of the Nintendo 3DS with aged lighting and textures. The camera angles themselves in places are more adventurous, enhanced by the stereoscopic 3D effect of the handheld, panning out to allow you to witness your surroundings, yet this is countered by situations where the angles it positions itself in is less than desirable, often causing you to misjudge jumps and inevitably increase frustration levels. For those that missed Rayman 2 the first time around, this latest iteration provides the perfect excuse to discover a highly regarded classic. Yet for those that have seen it all before, there isn’t much to entice you to pick it up again aside from a marginally improved camera system and, of course, the enhancement provided by stereoscopic 3D. Still, even eleven years on, Rayman 3D proves that Ubisoft’s unsung platforming hero has enough charm and style to rub shoulders with the very best of them.